Guys. This is the best soup. Like ever. I was basically licking my bowl when I finished. About a week ago, I didn't have a lunch packed for work. I had to go buy something to eat. Since I wanted soup, I went to a great place in my building. That day, one of the options was cauliflower soup. I had never had cauliflower soup before, so I thought I would give it a try. Well, my taste buds did a little dance to thank me for my choice! The soup was amazing, and for the rest of the week I dreamed about recreating it. In setting about my quest to recreate this delicious cauliflower soup, I imagined all the things that I would want in the soup. Delicate leeks. Caramelized roasted garlic. And loads of Parmesan cheese. When I finally made the soup, and it was beyond my wildest dreams. It was creamy and complex. And I shoveled it into my mouth, even though I was supposed to be leaving for barre class. Then I felt like throwing up all through barre. But it was worth it. Preheat the oven to 400°F. Clean your cauliflower and leeks well. Toss with olive oil and season with salt and pepper. Spread the leeks and cauliflower on a parchment lined baking sheet. Place garlic cloves, in the skins, on aluminum foil. Drizzle with olive oil, then wrap the foil into a packet to around the garlic. Place the garlic in the oven with the cauliflower and leeks. Roast for 20 minutes. After 20 minutes, remove the cauliflower and leeks and keep the garlic in the oven for an additional 10 minutes. Toward the end of the roasting time, sauté onions for 5-7 minutes or until softened in a glug of olive oil in a large Dutch oven or soup pot over medium-high heat. Add the roasted cauliflower, leeks, chicken broth, and thyme. Season with salt and pepper. When the garlic is done roasting, allow it to cool slightly then squeeze it out of the skin into the pot. Bring to a boil, then turn down to simmer for 20 minutes. Take the pot off of the heat. Add the cream and Parmesan cheese. Using an immersion blender, puree the soup until smooth. If you don't have an immersion blender, transfer the soup to a blender and puree in batches. Make sure to remove the plastic center of the blender lid to allow the steam to release. Cover with a kitchen towel to avoid splatter. Blend, then serve. This soup sounds incredible! 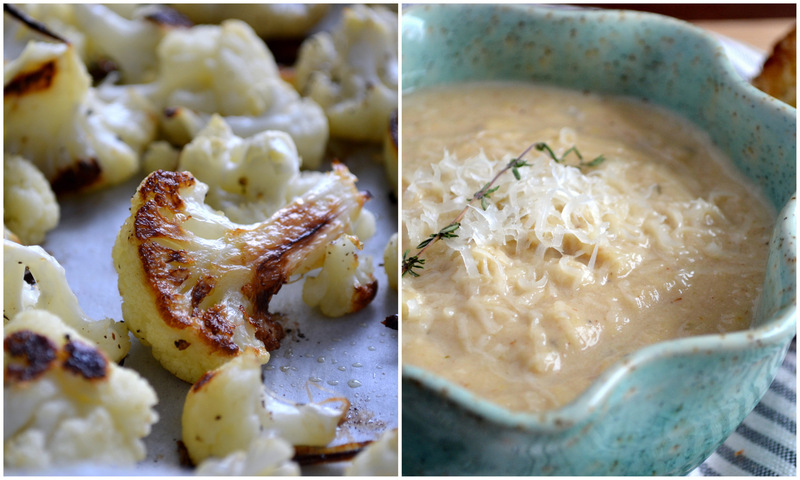 I love soups that are made creamy with cauliflower! I just came across your blog on Pinterest today and love it! I think we have a similar cooking/eating style! :) Can't wait to try some of your recipes! Yum!!! I've been on a HUGE cauliflower kick lately! Making it this afternoon! !